Between now and the end of this blog I’m going to live out a childhood dream of mine, and many other young children I’m sure, which is to be a paleontologist. Naturally for those like me who love dinosaurs, the feeling never really seems to leave us. And the films of the Jurassic Park/World series always do a good job of reinvigorating that burning desire to grab a pick and brush and go out into our backyards and start digging. Of course what we find are usually plain ole rocks that have no value whatsoever—but it’s always fun to pretend. When the first Jurassic Park film hit the screen over 20 years ago (one week after my high school graduation) I was floored. I never saw dinosaurs portrayed so realistically on screen! However realistically they looked, how they were used in the films wasn’t always as accurate as some paleontologist might argue. For example, it’s highly unlikely that a Brachiosaurus could stand on its hind legs, even for just a moment, to reach leaves atop a tree top. It really wouldn’t need to. In preparation for this blog, I watched all four films and wrote down each new dinosaur as they appeared—never repeating any species. Regardless of the title of the film series, many of the great lizards did not live during the Jurassic period, Parasaurolophus being one such example. The hadrosaur lived during the late Cretaceous period along with Triceratops and the T-rex. 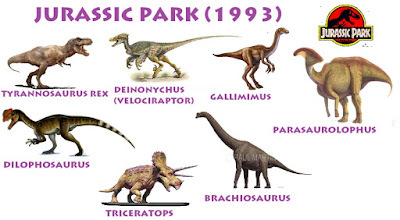 While I was watching the movies, it occurred to be that not only did these dinosaurs not live during the Jurassic period; they lived many millions of years apart. It’s hard to grasp how long that is considering humans have only been around for a comparatively short period, but who knows how a Velociraptor would react to seeing a Stegosaur? Not to mention their geographic differences. Spinosaurus lived in what is now North Africa, no other dinosaur in the series lived in that location while they existed. Now I’d like to group together all the dinosaurs from all four films and discuss when/where they lived and perhaps go a little deeper into their skeletal structure and classification. I think the best way and the way that makes most sense is starting with the earliest living dinosaur and working my way towards the end of the Cretaceous period, when the asteroid hit and essentially wiped them from the earth. The two earliest living dinosaurs in the films were the Dilophosaurus, which lived in N. America and the Dimorphodon (the small flying reptile from Jurassic World), which lived in what is now Europe. Both existed during the early Jurassic period. Right now there is now hard evidence to support that Dilophosaurus could spit venom or possessed frills that fanned out. Also the one scene in Jurassic Park is much smaller than a living version. A living Dilophosaurus reached about 20ft long while the one in the movie was maybe 6ft, unless the one in the film was not full grown. 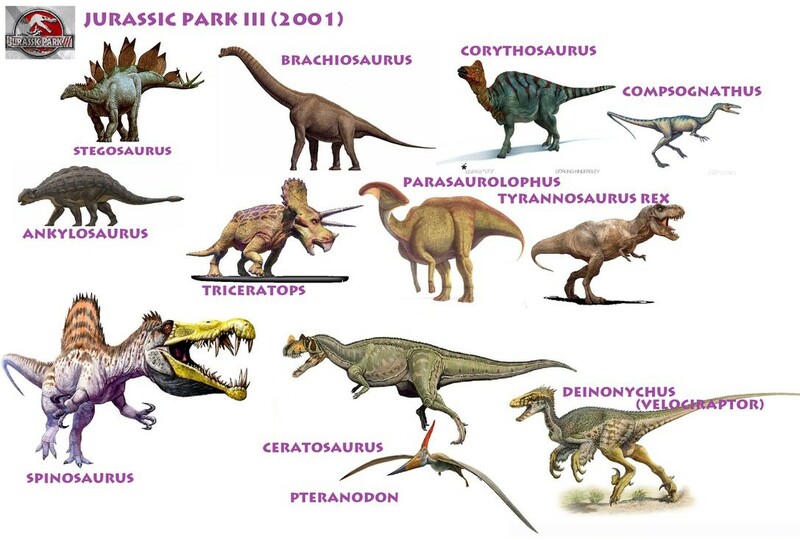 The rest of the dinosaurs were split pretty evenly between Jurassic and Cretaceous time periods, and the majority of the remaining dinosaurs lived in North America, with a few living in Europe and Asia, and one in North Africa. 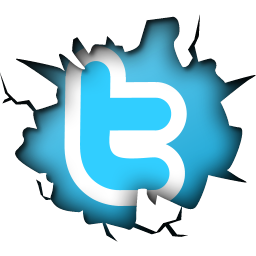 · Stegosaurus Note: Stegosaurus lived in N. America and Europe during the Jurassic period. So you can see here the T-rex and the Velociraptor did not live during the same time. Note: Stegosaurus lived in N. America and Europe during the Jurassic period. Note: Mosasaur lived in the inland lakes of Europe and N. America during this time. 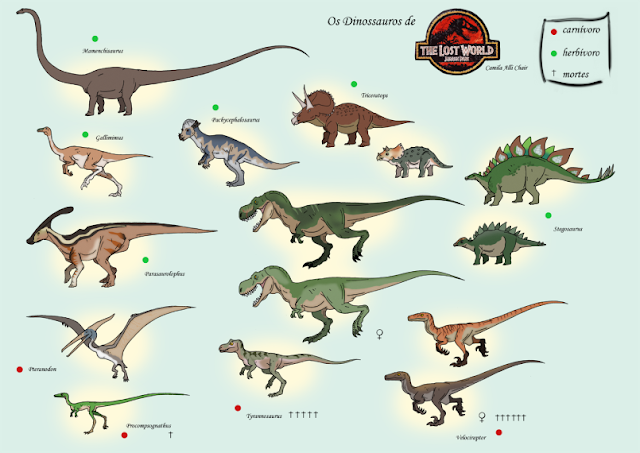 While I was mapping out this whole project, a few things started to become apparent as far as the dinosaurs classification. Most dinosaurs are divided up into two Orders which is determined by their hip structure, Saurischia (lizard-hipped) and Ornithischia (bird-hipped). The only exceptions here are the two flying reptiles, Pteranodon and Dimorphodon which are Pterosaurs, and Mosasaur is part of the Order called Squamata. All of the large herbivores like Brachiosaurus and the bipedal (two-legged meat eaters) like T-rex, belong to the Order Saurischia, while all of the bipedal and smaller quadrupedal herbivores, like Triceratops and Parasaurolophus belong to the Order Ornithischia. Breaking that down even further into suborders, there are three: sauropods (lizard-foot), theropods (beast-foot), and ornithopods (bird-footed). Try to think of sauropods as having feet like an elephant, theropods as having feet like a chicken or ostrich, and ornithopods as having feet like a rhino or hippo. All of the giant herbivores are sauropods, all of the bipedal carnivores are theropods, and all of the dinosaurs that have a bird-like hip, also have a bird-like foot structure. So there you have it. A quick run-down of the dinosaurs of Jurassic Park/World.